We had a looong day yesterday. My Aussie friend who leaves at the weekend wanted to take her mom (who is visiting) to Nippori and asked if I would like to go along - as a tour guide! I really wanted to go but didn't relish the idea of dragging Ebi-kun around a load of fabric shops also R-kun was penciled in for a final playdate in the afternoon. I had a chat with Ebi-kun and we decided to go to Nippori and then have lunch on the train on the way home then we would be back in time for R-kun if he could make it. (I didn't tell Ebi-kun that R-kun was coming just in case he couldn't). We made it to Nippori just as the shops opened, I grilled Liv's mom as she is a professional designer - I wish I had prepared a list of questions! I promised Ebi-kun that if he saw some fabric he really liked I would get it for him. He found some with aliens on it! I intended to just buy the few bits and bobs on my list but ended up with a load of stuff for the shop too - update coming up soon. I said my final goodbye to Liv, I know she will be back since her family live down the road but over this last year she has been a great friend and will be sorely missed. We made it back home by 2.30pm, shattered, R-kuns mom called to say they would come around 4pm so we had some quiet time. When R-kun arrived Ebi-kun was so excited, in fact over-excited, it took him quite a while, and couple of tellings off to calm down. I made the boys okonomiyaki for dinner, which disappeared really quickly, then they were back off to play. All too soon it was time to say our final farewells to Kym and R-kun, Kym has also been a great friend and was the one who encouraged me to sell the things I make in her shop, Liv was the one who pushed me to open the Etsy shop so I am indebted by their support and friendship, I will miss them both dearly. I will have to stop there or I will start sobbing into the keyboard. On a completely different note, I whipped up this mini cushion for my mother-in-law, I didn't know when I made it that the reason older ladies in Japan like owls is because they have a symbolic meaning that is something on the lines of an owl bringing an easier life for you. 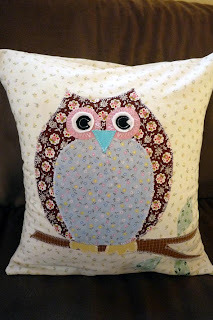 Love the cushion, didn't know that about owls! We just got back from a bike ride to the post office - it's bumpy but my Little Guy loves it. His bottom is still nicely padded in nappies. It's sad when friends go but you get used to it. I always feel happy that they are moving on to brighter pastures. New people soon come to fill the void and you find yourself with millions of wonderful friends all over the world. that's a beautiful owl, well done! that's a beautiful cushion Jo, I'm sure your mum-in-law will love it. While friends moving on is always a painful experience - I've been through it so much: almost all of our friends have left our little city for the big, bad world :( - I'm sure life will bring you new, equally delightful ones. big hug.